We're excited that our Greater Minnesota Rising project received mention in the Summer 2015 Regional Sustainable Development Partnerships (RSDP) Happenings newsletter! An initiative of Minnesota Rising, the project is being conducted in collaboration with Raising The Bar LLC, with support from the Central Lakes Regional Sustainable Development Partnership, Mary Page Community-University Partnership Fund, the West Central Initiative Foundation, and the Initiative Foundation of Little Falls, MN. The project is also supported in part through student research assistance provided by the Community Assistantship Program, a program of the University of Minnesota’s Center for Urban and Regional Affairs (CURA). Read on for more details and for the latest RSDP news from across the state! Greetings from the Regional Sustainable Development Partnerships (RSDP)! Last year the Partnerships, in collaboration with the Page family and friends, created the Mary Page Community-University Partnership Fund. The fund honors the memory and continues Mary Page's legacy as a trailblazing leader of RSDP and Greater Minnesota. This spring, the inaugural Page Fund support was awarded to research with the Minnesota Hazelnut Foundation on the market potential for hazelnuts. The project hired PhD student Amanda Sames, who found strong interest in this soil-saving perennial nut among high end chefs in the metro area and some interest in using hazelnut shells as a landscaping mulch. Her work is part of a broader effort to commercialize hazelnuts at the U of M that RSDP staff has been closely involved with, and later this summer the University's MnDrive research program is expected to make a significant investment in hazelnut research that builds on the work of Amanda Sames and many others. This summer, the Page Fund is supporting a student who will study how Northwestern Minnesota communities could better retain and attract young professionals. Humphrey School of Public Affairs student Brooke McManigal is working with Minnesota Rising, a group of millennial generation leaders, to outline the region's assets and challenges related to workforce needs and community vitality. The project is based on the hopeful work of Extension researcher Ben Winchester, who showed that, despite a net migration of recent high school graduates from rural areas, some parts of the Greater Minnesota have experienced a "brain gain" of people between the ages of 30-49. The Mary Page Fund is helping to further extend RSDP's work in communities throughout Greater Minnesota and within the University. We are excited to collaborate with Minnesota Rising and we look forward to Brooke McManigal's findings and what they will mean to recruiting and retaining younger leaders in Greater Minnesota. The Student Foodie newsletter is here. Sign up for it here. Sorry for the bad links! 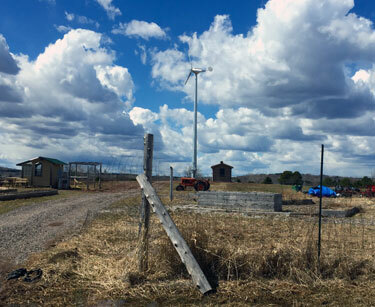 On Earth Day in April, University of Minnesota Duluth held a grand opening for its new wind turbine, located at the UMD sustainable agriculture farm. Now active, the turbine is both producing energy and serving as an educational tool for the whole UMD community. The 65 foot, 5-kilowatt Wind Tech, Inc. turbine operates with very little friction thanks to internal magnetic gears. These magnets transfer force between the input and output shafts without touching, allowing for nearly 98 percent efficiency. The design eliminates wear and the need for lubricating oil, reduces maintenance, and is thought to be well-suited for sites with intermittent winds. This novel, made-in-Minnesota technology came to UMD courtesy of funding and resources from nine different groups, including seed grants from Northeast Minnesota RSDP and Northeast Clean Energy Resource Team. Plans for the wind turbine began over two years ago, according to Northeast RSDP Executive Director Okey Ukaga. RSDP has been working with UMD on the wind turbine project since the beginning by providing funding and working with UMD representatives to choose the best vendors, and funding the construction of a small building near the turbine to house its electrical components. The foundation was poured in October 2014 and the tower was installed in March 2015. "Right now we are sending power to the power grid, and we eventually plan to use that energy to help power the farm. By sending the energy out to the grid, we can make a little dent in the amount that UMD pulls from it every day," said Ukaga. "When the wind is good we will be able to pull less energy from the grid." Through Renewable Energy for Greater Minnesota, CERTs offers custom project assistance and tools for rural farms and small businesses interested in pursuing renewable energy projects. CERTs staff can help people navigate the USDA REAP grant to help pay for 25% of a project's cost, and also flag utility rebates and other financing. See websiteor contact CERTs' Fritz Ebinger at ebing007@umn.edu or 612-626-1028. Are you interested in small-scale winter greenhouse production? Then join the Deep Winter Producers Association Facebook Group to connect with others and learn more! You can see recaps and videos of our Climate Minnesota convenings with Mark Seeley and Climate Generation in Crookston,Bemidji, and Duluth. We also have a recap of our Farmers Leading the Way event in Lamberton, including a one-hour TV special. We are now planning fall community convenings in Owatonna and Brainerd. This email is published by University of Minnesota Extension Regional Sustainable Development Partnerships. Copyright © 2015 University of Minnesota. All rights reserved.